공신녹권이란 공이 있는 신하를 공신에 임명하는 증서로, 이것은 조선 태조 4년(1395) 공신도감에서 나라를 세우는데 공을 세운 것을 치하하기 위해 최유련에게 발급한 개국원종공신록권이다. 발급기관인 공신도감에서 녹권을 받은 사람의 성명과 신분, 7회에 걸친 공신들의 공적내용과 포상, 지시 및 처리내용과 함께 녹권을 받은 105명의 공신명단 및 포상내용, 녹권 발급에 관한 기구별 담당관원의 직함 및 수결(지금의 서명)에 이르는 내용이 모두 208항에 걸쳐 쓰여져 있다. 조선의 성립과정과 공신들에 대한 대우 등 조선 전기 정치사 및 공문서 연구의 귀중한 자료로 평가된다. 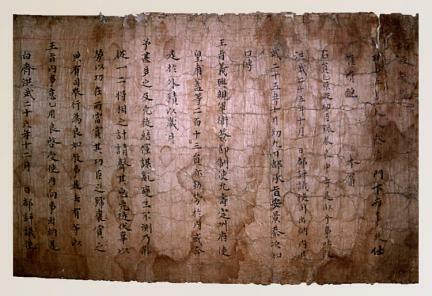 This certificate of annual stipend is one issued to Choe Yu-ryeon in 1395 (the 4th year of the reign of King Taejo, founder of the Joseon Dynasty) for his conspicuous role in the foundation of the new dynasty. Issued by Gongsindogam (Office of Records for Meritorious Subjects), the certificate contains statements about 208 items including the beneficiary’s name and position, details of meritorious deeds, list of meritorious subjects, and signature of the officials in charge of the issuance. It gives a glimpse of how the Joseon Dynasty was established, how meritorious retainers are treated, and what an official document of the time was like.